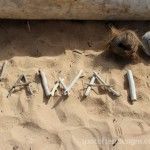 A few weeks ago, Derek and I used our hoarded vacation days for a 12 day trip to Hawaii! We opted to only do 2 islands to allow for both fun adventures and some relaxing beach/pool time. 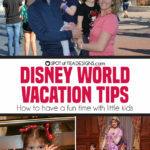 I put together a 3 post series with highlights of our trip in hopes that it might help others planning a trip! As we were already flying from NJ direct to Honolulu for 10 hours, what was a few more spent at an airport or on an airplane? We island hopped right over to Kauai to begin our trip on the tropical garden isle. 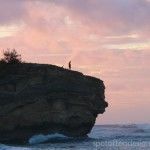 The Ultimate Kauai Guidebook: Kauai Revealed – Before your trip, I highly recommend purchasing this book, which we used a guide our entire stay on the island. (They make the same book for other islands, including Oahu Revealed: The Ultimate Guide to Honolulu, Waikiki & Beyond (Oahu Revisited) , which I recommend using as well). It’s broken up into smaller maps that were easy to follow and a descriptive guide of each section, town and recommendations along the route that were super helpful. I’ve noted below when we used their guidance to find several cool “secret” spots! 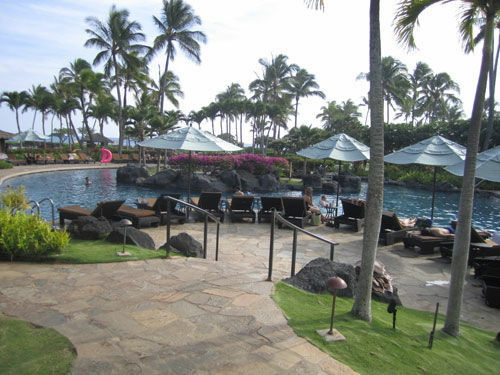 Grand Hyatt Kauai (Koloa) – We booked a great deal for 5 nights and a car at this beautiful resort through Hyatt vacations and were treated like royalty! After checking in and receiving fresh flower and bead leis, we were directed to our upgraded spacious room and informed of our “honeymoon amenities” – 1 free day cabana rental by the pool, free dessert at one of the on-site restaurants, and a bottle of champagne (good old self timer caught this one!). This place was gorgeous with multiple pool sections, a waterslide, salt water lagoon, restaurants and other entertainment options (see entertainment). Tip: Hit up a local grocery/liquor store and buy your own booze. The pool beers were $8 a piece, but they seemed to have no problem bringing your own, as long as it was drunk in a plastic cup provided at the bar. We did, however, enjoy lunch via the waitress service by the pool one day, which was delicious and not expensive. Bonus: Free self parking! Cons: $25 daily “resort fee” , a common occurrence in Hawaii, which gets you free use of their gym and classes (didn’t use), free hour a day on the tennis court (again didn’t use) but it also included internet so I guess I paid $25 for internet! BREAKFAST: Kalahoe Café (Kalahoe) – Per recommendation, we visited this busy little café…twice on our trip. 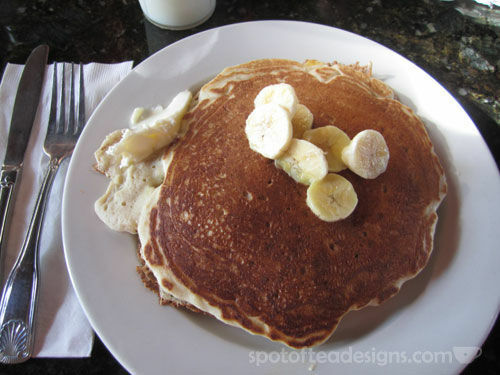 Both times I enjoyed the banana pancakes that not only had fresh bananas on top, but also include several baked into the fluffy stack. D opted for the special strawberry pancakes one day (note: strawberries were not baked in that one) and an egg and bagel sandwich on the second. Get the banana pancakes! 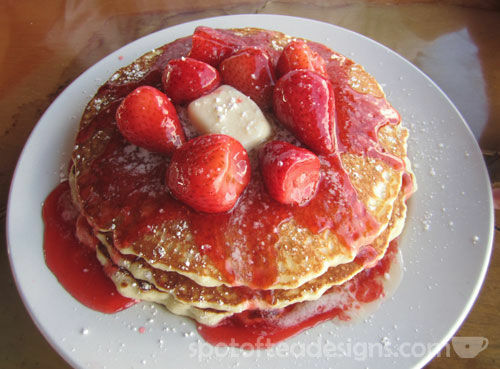 BREAKFAST: Olympic Café (1387 Kuhio Hwy, Kapaa, HI 96746) – D opted for the Strawberry pancake special (the LARGE order seen above) for the deal of a price at only $6.99 while I went for protein filled eggs and wheat toast. This delicious meal was enjoyed at a window seat that allowed for D to stalk all the surfers cars on their way up north with this surfing gear. 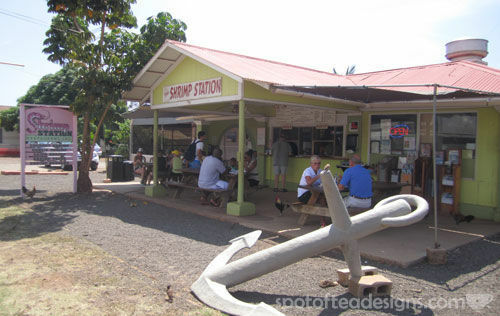 LUNCH: Shrimp Station (Waimea) – We didn’t have many lunches on the island, as we usually opted for some snacks from the grocery store that we munched on at a beach. But during our trip around the west side, we did stop at the recommended Shrimp House where D ate coconut shrimp. The meal was good, but try to avoid the outhouse style bathroom if you can! 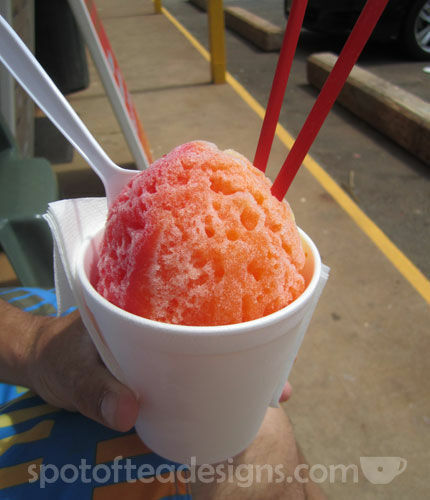 SNACK: Jo Jo’s Anuenue Shave Ice (5 Pokole Road Waimea, HI 96796) – Hawaii is known for the cool treat of shave ice. Not shaved ice, shave ice. It’s a very fine cup of ice that’s created by a very sharp blade. Different flavored syrups are poured on top for a yummy way to cool off. Here we opted to share a 16 ounce small (only $2.30) with passion fruit, cherry and lemon flavors. If I went there again, I’d suggest to pass on the lemon, as it was the least favorite of the 3, but there are something like 60 to choose from! DINNER: Donderos (at the Hyatt in Koloa) – I had the Capelli D’Angelo con Pomodoro while Derek dined on the Spaghetti alla Bolognese. We were both happy with our meal but still made room to split our free honeymoon dessert (an ok cannoli – not as good at the Italian bakeries back home, but still yummy!) We got a nice outdoor seat where we sat under the full moon that night! DINNER: Beach House (Koloa) – Here D had “the biggest risk I’ve ever taken ordering at a restaurant.” He went for the special, a local wasabi crusted white fish called Opah and he loved it! 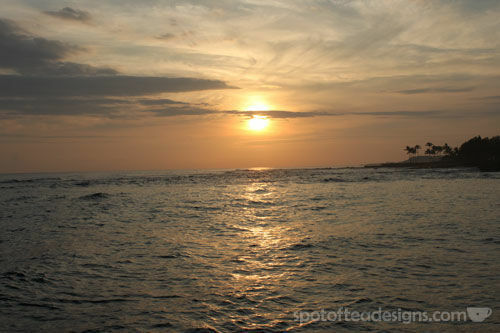 We went early to enjoy the sunset along their short wall before having a drink at the bar (D: Guiness, me: Lava flow, a frothy rum drink) then sat at our 7:15pm reservation. I enjoyed my grilled pork loin while we sat at a beautiful table near an open window towards the water. Highly recommended, but make reservations early in your trip. 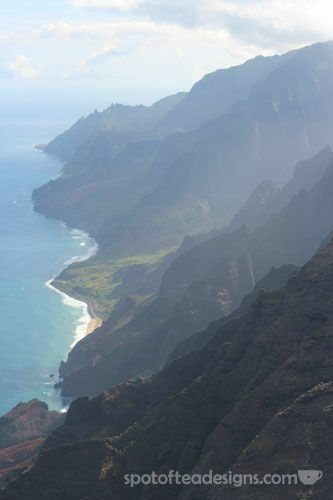 Blue Hawaiian Helicopters – While there is a road that follows along most of the coast of Kauai, there is one section, the NaPoli coast (seen above) that you can’t see by driving so we knew a helicopter tour would be on our to do list! 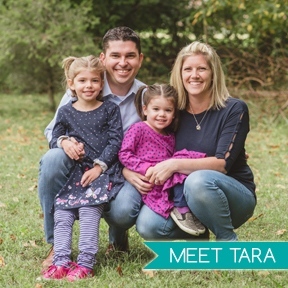 We booked a morning flight after Frank & Lauren’s recommendation from their August trip. 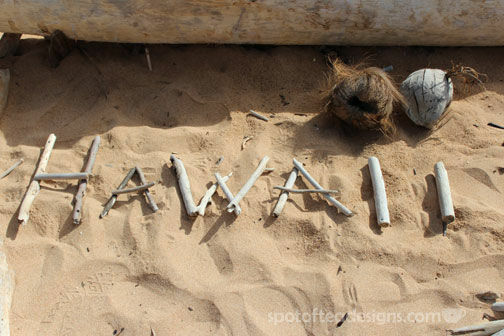 Definitely do this early on your trip as it helps you get oriented with this geography of this island! We didn’t get front row seats, but had no problems seeing outside from the back right 2 seats. Tip: Wear dark long sleeves. Not for the AC that’s pumping while you fly, but it helps when taking pictures when you’re hear a window. 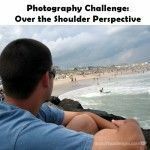 Otherwise you get the high reflection of your bare shoulders or light colored clothing. We took Dramamine, but I don’t think it was needed as the flight was smooth sailing, including take off and landing. (see that man all the way at the top left on the trail? It’s pretty steep!) It seems more daunting than it actually was, but of course they warn you to only do it during a dry day. 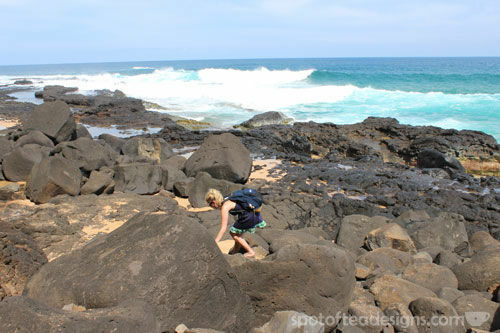 Once at the bottom, you find a nice, sandy beach, typical of Kauai’s shorelines. 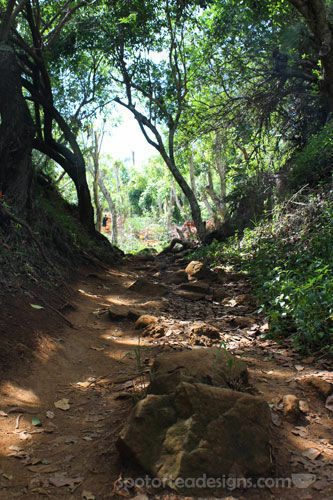 Continue reading and learn that another secret spot awaits you in this area, with a little more hiking. While you can’t see it from the mouth of the path, continue to right left and start to climb over these large lava rocks to find another peaceful spot. TIP: Wear your water shoes! We had left ours in the car, but I would recommend having these here for both climbing and for the lava pools you discover next! 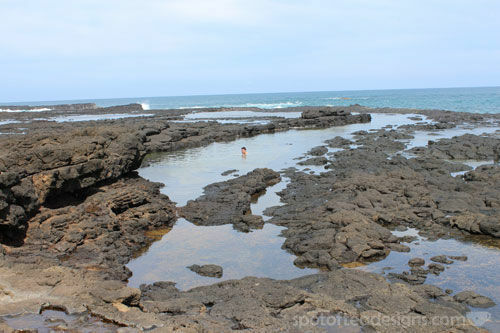 These warm pools of water still include small lapping waves, yet are deep enough to swim in but shallow enough to still feel comfortable. There were only a few others who made the trek this way to the pools but for a while, we were the only ones there. 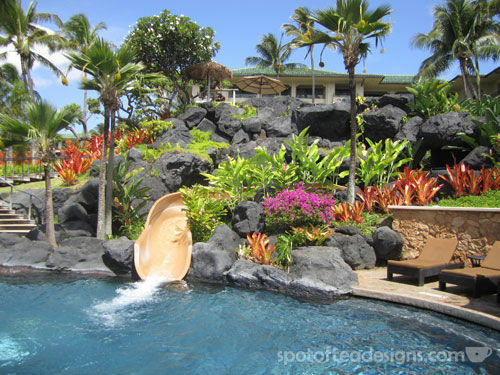 Luau at the Grand Hyatt (Koloa) – A trip to Hawaii wouldn’t be complete without a luau so we opted for the ultra convenient location of our own hotel! We purchased tickets for $97 at the concierge which included the buffet dinner, open bar and full show. Buffet was definitely the way to go for us as picky eaters, but we were happily full on the Kaula pig, steak and chicken options. D enjoyed several Kona Longboard brews, the drink of choice while on the island, where I had several only “ok” glasses of Pinot Grigio. The show was pretty entertaining, with fast and slow hula dancers, lots of outfit changes and singing galore. And no, we didn’t try the poi. 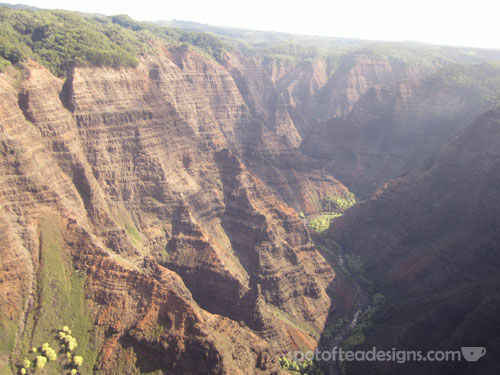 Waimea Canyon (west side of the island) – We broke down our trip into different sections, knowing that this side of the island would be a full day in and of itself. 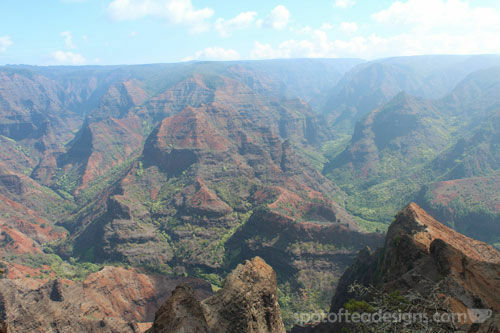 We packed our sneakers for hiking and set off to this picturesque “grand canyon of the Pacific.” This top picture is what we saw at one of the stops, while the first second picture under the helicopter paragraph was another view from above. Waimea means red dirt so you see lots of pictureque areas like the above. They say to wear crappy, old sneakers you don’t mind getting dyed and it’s not a bad idea. 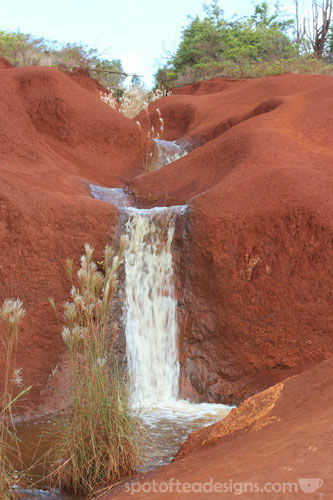 At the very top, grab some water and make the hike along the red dirt trail for some other scenic views. Feel free to email me if you want a better idea of my full itinerary from our 5 day trip or have any questions.